Heat and add 3 tablespoons of olive oil to a large pan. Add in all mince. Use a wooden spoon to stir and break up the meat, removing lumps. Cook until the mince is browned - 5 to 10 minutes. When the mince has browned, add the wine. Let the wine evaporate over a few minutes, stirring occasionally. Once evaporated, reduce the heat to very low to cook slowly. Meanwhile, heat another pan to a medium-high heat. Add all chopped vegetables and sauté for about 5 minutes until soft. Transfer vegetables into the larger pan with the mince. Increase heat to low-medium then add the passata and stir thoroughly. Season with salt, pepper and herbs then cook for a further 5 minutes. Add enough of the hot stock to cover the mince and vegetables. Reduce the heat to very low, cover with a lid and simmer for 1 hour, stirring occasionally. Remove the lid and keep simmering for approximately 30 mins, stirring occasionally, until the sauce has reduced and lost most of its liquid. At this point stir in the milk. Continue simmering until most of the milk has been absorbed. Once your ragu is ready, stir through cooked pasta. 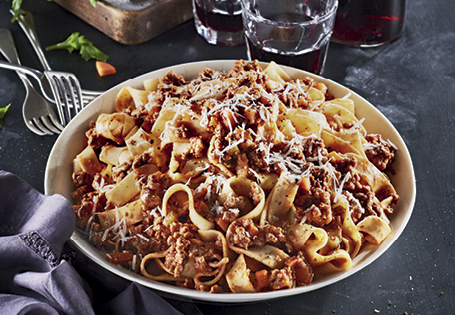 Pair the Pork and Beef Bolognese with One Road Cabernet Merlot 750ml available in selected stores.